For teachers overburdened by work, it can often result in a lack of motivation and energy, poor teaching skills, and low self-esteem. 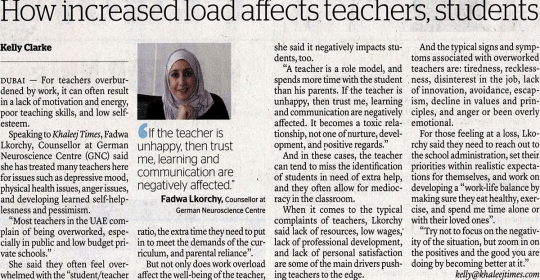 Speaking to Khaleej Times, Fadwa Lkorchy, Counsellor at German Neuroscience Centre (GNC) said she has treated many teachers here for issues such as depressive mood, physical health issues, anger issues, and developing learned self-helplessness and pessimism. She said they often feel overwhelmed with the “student/teacher ratio, the extra time they need to put in to meet the demands of the curriculum, and parental reliance”. But not only does work overload affect the well-being of the teacher, she said it negatively impacts students, too. And in these cases, the teacher can tend to miss the identification of students in need of extra help, and they often allow for mediocracy in the classroom. When it comes to the typical complaints of teachers, Lkorchy said lack of resources, low wages, lack of professional development, and lack of personal satisfaction are some of the main drivers pushing teachers to the edge. And the typical signs and symptoms associated with overworked teachers are: tiredness, recklessness, disinterest in the job, lack of innovation, avoidance, escapism, decline in values and principles, and anger or been overly emotional. For those feeling at a loss, Lkorchy said they need to reach out to the school administration, set their priorities within realistic expectations for themselves, and work on developing a “work-life balance by making sure they eat healthy, exercise, and spend my time alone or with their loved ones”.